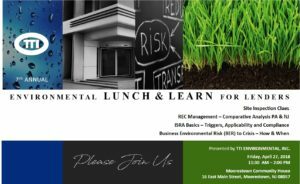 RSVP Now for TTI's 7th Annual Environmental Lunch & Learn for Lenders, April 27, 2018 | TTI Environmental, Inc.
And of course enjoy a delicious free lunch with colleagues! TTI has over 30 years of experience in providing consulting services to lending institutions which has allowed us to develop strong relationships with many different loan officers and risk assessment managers across the industry. TTI provides services to the Northeastern and Middle Atlantic portions of the United States and maintains the appropriate licenses, certificates and company credentials necessary to perform the technical and administrative aspects of the due diligence process.